Introduce Brand New Twin Turbo Front Mount Intercooler. This intercooler cores and complete units feature top quality materials and construction for strength and durability against vibration. Each and every core is pressure tested to ensure flawless performance. JDM cores utilize state of the art Extruded tube and fin type construction. This design has proven itself to be a top performer in almost every automotive racing arena from LeMans to import drag racing. Our cores Utillize Micro Extruded Cooling Tubes for quick and efficient heat dissipation while using a slightly less dense outer fin setup to provide excellent air flow to the radiator. 100% Brand New Never Used or installed. Made By OEM Approved and ISO Certified Manufacturers. Construction: Machine Cut and Stamped Hand Welded. Pressure Drop:25psi at 35psi ; 0.20.5psi at 15psi. Hot Air Temperature: 32°F302°F (0°C150°C). Compress Air Flow Rate: < 350 Cubic Feet/Min Rated to 850 Max HP. Made by high performance quality. T-6061 Billet Aluminum Construction for Strength and Durability. Core Size: 24"x11"X3. Overall Size: 32"x12"x3. Two 3" Inlet & One 3" Outlet. X1 Twin Turbo Front Mount Intercooler. 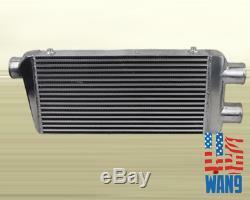 This intercooler is perfect for many twin turbo application, like Mustang Camaro Supre Viper... This unit is not for OE replacement or direct bolt-on installation. This product recommend professional installation. No Instruction Included Professional installation recommended. E-checks are automatically held until the established clearing date, to reduce any delays please provide a valid telephone number upon the checkout. If you're located outside of the continental USA. If this process is not completed, delays and other issues will occur. Please inspect your order upon receipt. Because we always test fit our products, it is rare that our item will have fitment issue. If in case the item you receive does not fit your car, we need to ask you for digital picture so that we can assist you. Most aftermarket items do not come with instructions and professional installation for all item is highly recommended. No exchanges will be issued on products that have been damaged or used improperly (Modified). We will work with you and solve the problem. We ALWAYS recommend professional installation. All emails are to be answered within 24 hours except Sat and Sun. What happens if the item is out of stock? We try our best to have all items we list and since all items are constantly listed. Occasionally, due to high demand or human error we may be temporarily out of stock. All emails will be replied in the order it was received. We usually reply within 24 hours, In some cases emails are lost in the spam or junk folder so please check them regularly. Powered by Solid Commerce The All-in-One Listing, Inventory & Order Management Solution. The item "Universal Twin Turbo Intercooler 2-In 1-Out 32 x 12 x 3 Front mount Aluminum" is in sale since Thursday, July 20, 2017. 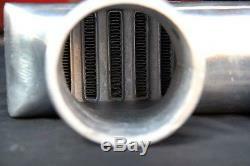 This item is in the category "eBay Motors\Parts & Accessories\Car & Truck Parts\Turbos, Nitrous, Superchargers\Turbo Chargers & Parts".wan9" and is located in Rowland Heights, California. This item can be shipped to North, South, or Latin America, all countries in Europe, all countries in continental Asia, Australia. Dimensions: Overall 32"x12"x3" / Core 24"x11"X3"